How appropriate that, on Bastille Day we are joined by two delightful French WWOOFers. But instead of fireworks and festivities there’s a lot of docks! Their English vocabulary centres around the word “weeding”. We all join in, of course. We quietly hum a refrain of two of the Marseillaise. In the polytunnel the courgettes are proliferating madly. Last year, incredibly, we had too few. This year it’s back to normal. That’s courgettes for breakfast dinner and tea then. The exotic salads are settling in. If you’ve never tried iceplant, do! It’s crunchy, succulent and salty. I love watering the polytunnel when I can graze on that. The aubergines are loving the warm conditions and flowering now, even after a late start. 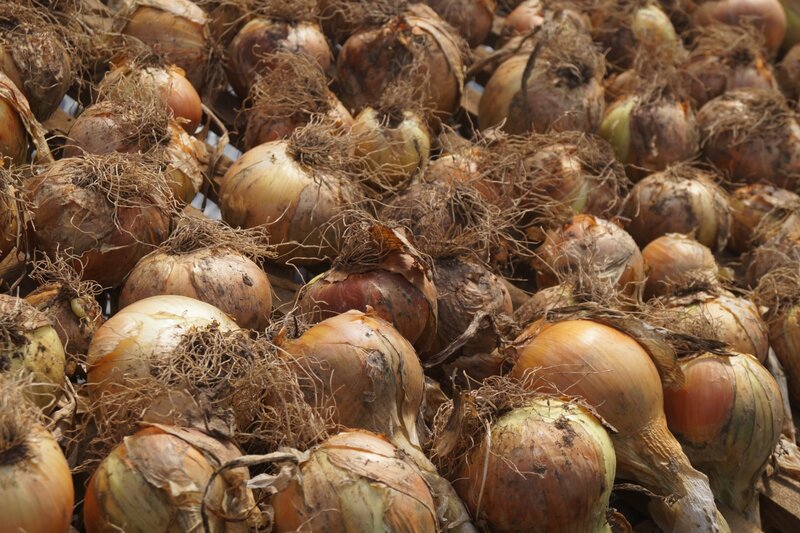 Outside, the Autumn-sown onions and some rusty but otherwise ok garlic are lifted to dry. So as not to leave bare ground, they were replaced with a sowing of field beans as green manure. If they look likely to bear fruit before the Winter kills them off, we will cut them down and let them decompose into the soil – nitrogen fixing and humus building. And we didn’t condemn the French girls to docks all day. We squeezed in some more leeks, making teamwork of the job – one dibbing the holes, one trimming and dropping in the plants, and a third filling the holes with water. Two hundred more leeks in no time. In the greenhouse we pricked out some “belts and braces” Winter brassicas before risking the slugs outside with the rest. It’s been perfect blight weather for a week now, so we are keeping a keen eye on our spud plants. We found one “Desiree” with an obvious dose of blackleg. Having removed it carefully and bagged it up for disposal, we’ll keep our fingers crossed that it was an isolated case – it generally is. Our end of day ritual refreshments were as sociable as ever. We toasted red caps and revolution with a cup of tea and a slice of raspberry jam-filled Victoria sponge. How entente cordiale is that!